alcohol and non-alcoholic beverages (premium alcoholic beverages available for an additional charge). Dennis had a group on this boat in 2018 and everyone raved about the trip. So Randy’s going to take another group in 2020. Your Galapagos Liveaboard diving adventures will encompass everything from sharks to nudibranchs, and more. The islands are best known for amazing shark diving around Wolf and Darwin Islands. These small and remote islands are best reached by liveaboard vessels for divers. Your diving experience here will generally include Galapagos sharks, silky sharks and lots of schooling hammerheads being cleaned by king angelfish. Seeing marine turtles, schools of tuna, eagle rays, and sea lions is very common and seeing a whale shark is very possible from June through November. All the islands you travel to are amazing sites for underwater photography. There are also many unique things to view on land. Consider adding on some time to your trip to experience the land animals as well. And of course, a trip to the Galapagos would not be complete without taking time to watch their most famous inhabitants – the giant tortoise! Currents can range from 1 to 5 knots at the sites we visit, and visibility is generally between 30 and 80 feet. Most divers are comfortable with a 7mm wetsuit June – November with a hooded vest and gloves and a minimum 5 mm wetsuit December – May. Gloves and hood are strongly recommended. Trip price does NOT include airfare. 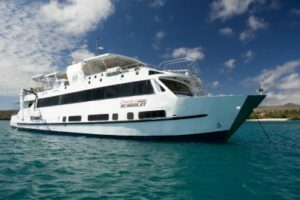 It also does not include fuel surcharges or marine park fees (payable on the boat). Trip price is subject to change without notice, but full payment guarantees the price. $1,000 non-refundable deposit holds your spot. Additional payents will be due as the trip draws closer. Ask for details when you pay your deposit.